Hi everyone!! I hope that you are having a fantastic day!! I enjoyed some scrapping time last night and I went to bed a little later than I intended to, so I am dragging a little today, but I am happy with the cards that I was able to complete. I will have two posts today, so check back later for the other one. This first one combines the Mojo Monday Sketch 121 with the Moxie Fab World Color Challenge. I will admit that this color combination is definitely not one I would choose to do on my own. I had a hard time trying to figure out what to do with this color combination, but with this sketch from Mojo Monday and my Circle Circus stamp set from Stampin' Up! I was able to make it work for me. This card was calling out for ribbon, but I didn't have any that matched these colors, so I took a strip of the Marigold Morning cardstock from Stampin' Up! and wrinkled it several times, then I bunched it up along the top of the card and adhered it with stitching. Cardstock, stamps, ink, brad, punches: Stampin' Up! Don't forget that I will be posting blog candy in the next few days, so stop by and check it out. WOW! That is some color challenge and you did a great job with it! I would have stuck my head in the sand. Love the circles - great Mojo. Fab card, you did great with the colours. Just used Circle Circus for first time at SU night, thanks for the extra inspiration! This is a wonderful card! 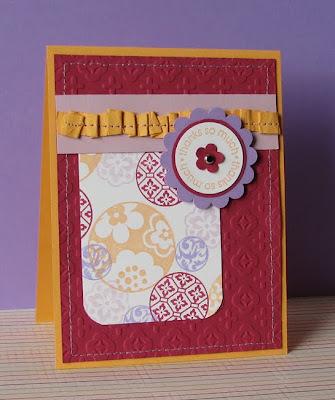 I love the embossed background, and that you stamped your own patterned paper!! Love it! Great job with the Moxie Fab color challenge! Love all of the texture and pattern on this! Beautiful card! Great job with the color challenge.